Monster Cable Monster Rock 1/4" Straight Instrument Cable 6 ft.
Voted the "Favorite Guitar Cable" in Guitar Magazine's 2009 Reader's Choice Awards, Monster Cable's Monster Rock 1/4" Straight Instrument Cable is a high-performance, application-specific cable designed to enhance sonic bite and character. Patented Time Correct windings provide a phase-aligned signal for accurate sound, and MicroFiber dielectric preserves the fast transients, clean highs, and vivid harmonics. 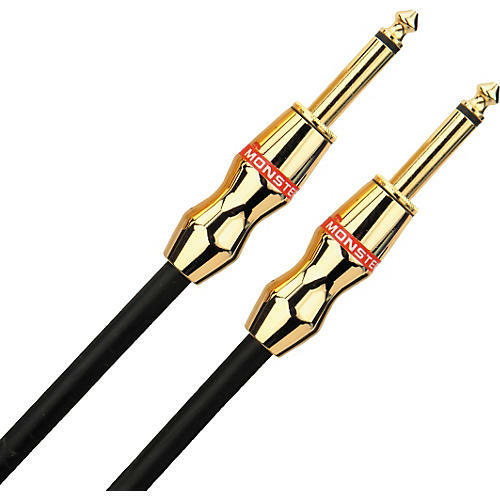 A dense shield rejects interference and hum, and heavy-duty 24k gold-plated connectors increase conductivity.